This was the book that started it all. It was back in early February 2000 when I first came across this book in the Kyobo Book Centre in downtown Seoul. 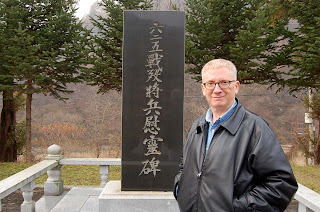 At the time I was a regular contributor to the Korea Times‘ Thoughts of the Times column in the Op-ed section and I thought that maybe I could do a book review; after all, it was the 50th anniversary year of the start of the Korean War. This book and the subsequent book review led me on an amazing three-year journey as I “discovered” a forgotten war, just as much as Michael does in War Remains. I owe a lot to his book and the veterans who penned the stories and poems inside. In middle-class middle America, the accidental discovery of a missing veteran’s footlocker jogs buried memories of the Korean conflict. This is the starting point for Jeffrey Miller’s “War Remains,” a novel themed around war, amnesia and remembrance that is published, appropriately, on the 60th anniversary year of the conflict’s eruption. There are few American historians or novelists of the Korean War; fewer still with first-hand knowledge of Korea’s landscapes or people. Miller, an American resident of South Korea and former columnist for The Korea Times, is the exception. Having interviewed dozens of veterans, he is as familiar with the soldier’s gun-sight view of the battlefield as with the big picture presented in cold war political histories. Unlike World War II and Vietnam, Korea was never memorably captured in literature or on film. “War Remains” helps fill that gap. Miller’s novel casts vivid light on a forgotten conflict in which superpower grappled with superpower on Asia’s grimmest killing fields, but his real achievement is in the poignant illumination he sheds upon the human cost stemming from statesmen’s failures. War Remains follows the tale of Bobby Washkowiak and his grandson Michael, who explores the past in order to find out exactly what happened the day his grandfather went missing. Alternating from present day to wartime past, the novel unfolds through pulsating battle scenes, personal vignettes and quiet introspection, making use of jumping perspectives in order to create an intimate tale of loyalty, love and livelihood. You can read the rest of the review and the interview here. How I discovered a "forgotten war"
I confess, when I came to Korea 20 years ago, I didn’t know much about the Korean War. I knew of the war, but not much. Even though I minored in history, my knowledge of the conflict was severely and sadly limited. What I knew and what I didn’t know would all change that cold day in February 2000 when I bought Retrieving Bones. If there is any penance for my ignorance, or autobiographical underpinnings in War Remains, look no further than the character of Michael. 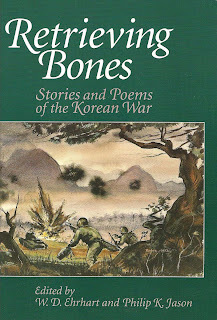 Much of what Michael does to learn about the Korean War was what I did after I read Retrieving Bones and the other books I read and reviewed for the Korea Times, as well as the articles that I would eventually write about the Korean War Commemorative events in Korea. I knew when I started writing my novel that I could never really accurately describe combat or know what it was like because I have never been in combat. But what I could do, and what I knew I could do well in the novel was write about what it would be like for an ordinary person to learn about a war the way that I did and the way that Michael does in the novel. This book is dedicated to…. I knew from the beginning, when I sat down and started writing War Remains that I would dedicate the book to my mother, my eighth grade English teacher, Arlene Gandolfi and Oscar Cortez. My mother was proud of me when I started writing for the Korea Times in 2000 and went around LaSalle-Peru showing everyone the clippings from the newspapers I had sent her with my articles in them. She was always after me to write a book but I never knew what to write about and kept on telling her, one day mom, one day. Mrs. Gandolfi first encouraged me to write when I was in the eighth grade at Washington Grade School 1971-1972. It all started with his science fiction story we read in class and some extra credit for writing a short story. I started writing a serialized story about invaders from Mars that Mrs. Gandolfi read in class. I included all my classmates battling Martians and saving Oglesby, Illinois from destruction. Very early on in life, I understood the meaning of, “the pen is mightier than the sword.” Of course, my classmates were not too thrilled when Mrs. Gandolfi gave quizzes on my story; they felt I had an unfair advantage as the author. Interestingly, Norman Mailer’s first story, written when he was in elementary school, was also about an invasion from Mars. I first met Oscar Cortez in 2001 when he visited Korea with a group of Korean War veterans from San Antonio. His story about his military service in the Korean War, was one of the inspirations for War Remains. His story could have been the story of any man who was thrust into extraordinary circumstances during the war. The book is also dedicated to all Korean War veterans and their families, as well as those families who lost a loved one during the war, or who are still waiting for a loved one to come home. And finally, I dedicated the book to the men and women of the US Second Infantry Division who to this day, still help to keep peace on the Korean peninsula. 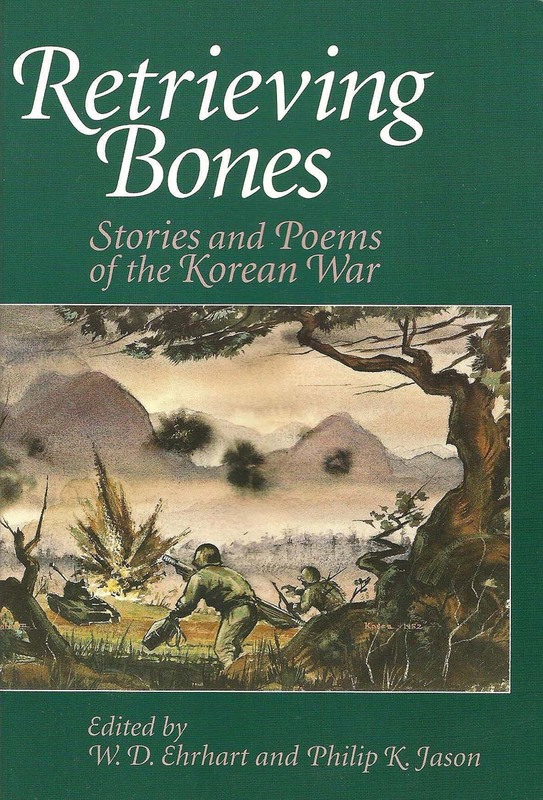 The day I held Retrieving Bones—a collection of short stories and poetry written by Korean War veterans—at the Kyobo Book Centre in downtown Seoul one cold February afternoon in 2000, was the day I started writing War Remains. As I stood there in Kyobo, debating whether or not I should pay the 39,000 Won for the book, I convinced myself that if I bought the book, I could maybe write a book review for the Korea Times; after all, this was 2000 and the 50th Anniversary of the start of the Korean War. Maybe, the editor would go for the idea. He did and asked me if I could write more book reviews. I said I could. And that is what got me started down the road as a feature writer for the newspaper and covering many Korean War commemorative activities in Korea from 2000-2003. It’s true, I was an accidental journalist, but for the first time since college, I was writing almost on a daily basis and at the same time becoming a part of history while learning about history and above all, discovering a forgotten war. In May 2001, I had the opportunity to meet some Korean War veterans from San Antonio who came to Korea to commemorate Chipyong-ni, an important battle of the Korean War in February 1951, which turned the tide of the war for the US Second Infantry Division (2ID). Most of the veterans had served in the 2ID, including Oscar Cortez who was captured by the Chinese on February 12, 1951 north of Hoengsong—east of Chipyong-ni. When I sat down a little over a year ago to begin writing War Remains, I had in mind that battle. Although the battle itself would not be featured prominently in the novel, it was part of the inspiration. It’s a good thing I bought that book that day. It changed my life forever. What I mean is that when I sat down and started to write War Remains in September 2009, I saw or envisioned the story as a movie. I knew how the book would begin and how it would end, and I saw these two scenes as scenes in a movie, kind of like bookends. Having never written a novel before, seeing the book as a movie made it easier to write. Other than a few short stories and some feature articles for the Korea Times, I had never attempted anything quite as ambitious, so seeing the novel as a movie helped me in terms of how I would move the story along, especially with some of the flashbacks. Maybe those two semesters of film classes at SIU (Southern Illinois University) finally paid off, as well as being a film buff my whole life. Oh, one more thing: I thought about writing a screenplay of the story while I was writing the novel. You know, I can see a Steven Spielberg/Tom Hanks Korean War movie collaboration once they finish WWII. The Second Infantry Division and 38th Infantry Regiment would be very good units and subject matter for Spielberg and Hanks to cover.